Historically, Florida has been one of the strongest commercial real estate markets in the country, with continually solid returns and safety for the capital of global & domestic investors. Within the state, South Florida commercial real estate leads the way supported by strong population growth and tax-friendly laws. It’s not just the population growth that makes it an active and enticing market, but also the high volume of attractive real estate properties, the diverse cultural offerings, and the fact that it’s a travel destination for large segments of the population. It’s also a central hub for international business, especially from South America. With growing investment from global players in China, Canada, Germany, Singapore, Saudi Arabia, and Qatar up substantially coinciding with the current economic conditions, there are many reasons why South Florida remains a popular place for commercial real estate investments. All of these aforementioned factors aggregate to continually make it a hot investment opportunity. Below are the top 7 reasons why South Florida is one of the best commercial real estate markets for investors, including: population & business growth, business incentives, foreign investments, & high yields on investments. South Florida has maintained consistent population growth since the early 1900s according to Worldpopulationreview.com with an average growth of 2% per year since 2010. Miami’s population is forecasted to grow 1.4% in 2018, while Palm Beach is forecasted to see a 2.8% increase over the same time. Miami also ranks 8th in terms of business growth since 2010 (+2% per year), and 18th for wage growth (+3.3% per year) with both measurements outpacing the national average, 0.7% and 1.9% respectively. A growing population and rising incomes pair well for stimulating the economy in any region. These factors combine to create a solid foundation for the witnessed retail growth in South Florida. Retail growth in Miami and South Florida has been explosive in recent years. Investment continues to flow into retail and shows no signs of letting up. Among the top retail markets in the country, Miami saw 5% growth in hospitality employment in 2015, reaching an all-time high in jobs in that sector. Additionally, from July 2017 to 2018 Palm Beach saw a 4% increase year-over-year, where the national average was up 1.6%. The $1.7 billion Miami Worldcenter, a 450K square foot project set to be completed in June 2019, and $1 billion Brickell City Centre are among the largest construction projects in downtown Miami. Florida is attractive to businesses for a number of reasons. With no personal income tax, investors and entrepreneurs flock here to reduce their tax burden. According to Chief Executive Magazine, Florida is the #2 rated state for business and according to Tax Foundation, it is the #1 tax climate in the southeast, and #4 in the nation. For these reasons, 20% of U.S. businesses that export are located in Florida. The state also ranks 5th nationwide in high-tech employment. To further bolster the state’s standing as far as taxes and personal investments are concerned, Retirementliving.com ranks Florida as the #5 most tax-friendly state for retirement, and Kiplinger ranks it #8 for the same category. Various factors (cost of living, tax rates, average income, etc) help illustrate why Florida is a perennial favorite for business and personal finance. In 2017, Florida was the #1 state where foreigners bought and sold commercial property. Additionally, as of 2015, Florida ranked fourth in the U.S. for cross-border capital flow, as an increasing number of international investors jumped into the real estate market. The investment rate has reached a 9-year high as of 2016 with $4.3 billion in investment from outside the U.S. flowing, up 85% from 2014. That growth has been driven by a larger number of countries as well, with new investments from Canada, Spain, Germany, UAE, and China. 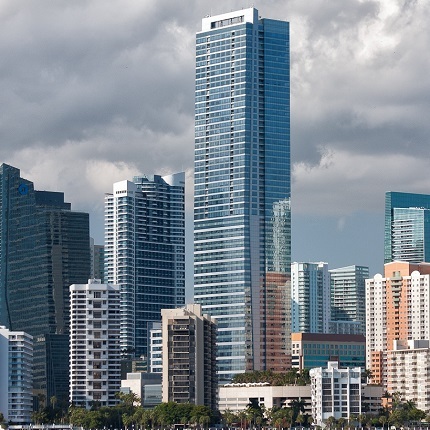 Latin American countries suffering from poor economic performance are investing heavily as well as they see South Florida commercial real estate as a haven for capital. To further illustrate these international investments, Florida’s commercial real estate market is ranked #1 for international investors as previously mentioned. Specifically, South Florida presents a wealth of opportunities for these investors with Orlando, Tampa, West Palm Beach, Ft Lauderdale, and Miami as anchoring cities. Compared to other global gateway cities and existing cultural hubs in the U.S., I-90 corridor, and in Europe, South Florida offers comparatively higher yields on investment. Assets in Florida markets are performing strongly right now with a 10% gain in the first half of 2016. Other Florida cities like Orlando, Tampa and Jacksonville have also been targeted due to these higher relative gains. In South Florida specifically, Orlando, Tampa, West Palm Beach, and Miami present a wide range of commercial real estate properties and opportunities for positive returns. Combined with low-interest rates and a strong job market, REITs have had a major impact on the Miami commercial real estate market. A record 15.5 million people visited Miami in 2015 and the population of the city has grown by nearly 8% in the last five years to 2.7 million. The combination of this growth and institutional investment from outside developers has meant more rapid growth than would otherwise be possible, and consistent interest in the region. Commercial real estate in Florida and South Florida have been strong, consistently performing investments for both domestic and global investors, and continue to generate capital growth as the area grows and flourishes. Whether evaluating Florida NNN properties for sale or other commercial investment opportunities, there has never been a better time for commercial real estate investments in Florida. Consistent population growth (mentioned at the start of the article) and home building combined with healthy tourism (Florida ranks #2 of all U.S. States) provide a solid foundation for capital to flow into the region’s retail market. Those elements along with continual construction projects serve as a positive sign of growth across many other CRE sectors. Some of the recent CRE highlights in the region include: Palm Beach posting a record quarter for Q1 2018 in multifamily sales, Miami-Dade retail posting positive growth in the same quarter as far as sq. ft. valuation, and Broward County showing healthy signs in various sectors, especially in regards to office sales with an increase of 15% year-over-year. Time will tell, but the overall sentiment in regards to South Florida commercial real estate is looking upward and onward. MMG Retail News: The MMG blog features key industry news and market updates about South Florida commercial real estate, with a specific focus on retail trends. Colliers’ Market Research: Colliers International is a global industry leader in both residential and commercial real estate. Their South Florida branch opened in 1990 and focuses on the tri-county region of Miami, Ft Lauderdale, and West Palm Beach. CoStar: Founded in 1987, CoStar pledges to create efficiency and transparency in commercial real estate. It’s the ­first company to offer real estate firms comprehensive, objective, and reliable information. The Real Deal: The Real Deal provides the latest real estate news and press releases. Their company focuses on three main regions: Miami, New York, and Los Angeles. Business Journal: The Business Journal is nationwide, and has the latest breaking business news for major regions across the United States, including South Florida. Their news section is updated around the clock for all major markets. BisNow: In their own words, BisNow is “intensely curious about commercial real estate” and they are “here to help you be curious (and nerd out) about real estate.” They not only publish news, but also produce hundreds of CRE conferences. CRE-sources: Their website aggregates commercial real estate news & reports for office, industrial, retail, and multifamily sectors of the commercial real estate markets in Central & South Florida. World Property Journal: Their Miami-focused page illustrates the latest news in the CRE market across all of the major sectors.